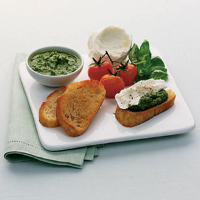 Pesto tastes great tossed into fresh pasta or teamed with Mozzarella and vine tomatoes on bruschetta. The addition of walnuts gives this alternative an extra-nutty taste. Put 40g chopped basil into a blender and blend, or crush in a pestle and mortar. Gradually add 20g pine nuts, 15g chopped walnuts, 20g grated Parmesan, 1 large garlic clove (chopped) and, finally, 80ml extra virgin olive oil. Season and blend till smooth.